Galloway Engines is a family run business operated by a father and son team. Laurie Galloway started the business in 1978, and it has been at the forefront of precision engine machining and complete engine reconditioning ever since, with its modern plant and equipment. Their large workshop focuses on every aspect of engine reconditioning from performance and racing, industrial, agriculture and mining, classic and vintage vehicles to original and warranty work. There is a large cost in powering the plant and equipment. Laurie contacted Solargain through our Commercial website in April 2014. Within a few weeks of consultation we had provided Laurie and David with a comprehensive proposal, showing the designs of both a 30kWp and of a ‘table-topped’ 30kW inverter capacity system with 40kWp capacity of panels, calculated annual benefits, return on investment and estimated payback times on systems designed to their requirements. Solargain also worked in conjunction with Galloways to allow for re-sheeting of the roof before the installation of the solar PV. With plenty of roof space available, it was easy to design a system keeping clear of any shading issues around vents and skylights. This allows David and the team to operate the business well into the future without a need to maintain the older tin roof in later years. Although the system has only been installed for a short time, it has proven to be cutting the bills substantially for Galloway Engines in line with Solargain’s original calculations. With savings on energy bills compared with similar times in the previous year of between 65% and 80%, this has also allowed the company to drop down to a lower electricity tariff rate, thus saving even more than they would have with solar energy offset alone. 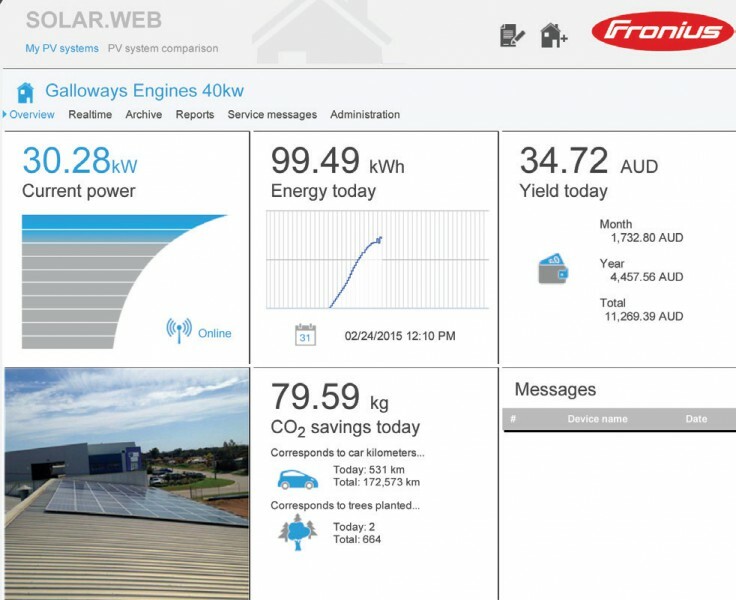 The solar PV system comprises of 160 x 250W Renesola panels and 2 x 15kW Fronius Symo inverters with Fronius Solar Web monitoring via WiFi. This monitoring can be accessed anywhere in the world on PC or mobile device by David or Laurie. The system is split evenly across the east and west roofs and is flush mounted.